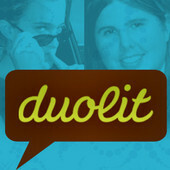 Today’s post is a quick Q&A with “The Self-Publishing Team”, Duolit! Laura: Like 30 Day Books, you are one half writer, one half techie! The difference being that you’re not married :) So how’d you know each other? We actually met many, many, (MANY) moons ago in the second grade and became instant friends. Our hometown, St. Augustine, Fla., is pretty small so even though we went to different schools for a few years we stayed close. Eventually, we both went off to Florida State and became roommates. After graduation we spent about a year doing different things, but then we both wound up moving back to our hometown and going to work for the same company (total coincidence, really!). Laura: Tell us about your own writing and publishing journey. I [Shannon] decided I wanted to be a writer when I was about eight years-old (around the same time I met Toni, actually) but I didn’t get the opportunity to sit down and complete a novel until after college graduation. I was really excited, but after finishing the book I hit a brick wall. I didn’t know what to do next — what were my options? Toni was the one who first told me about self-publishing — she helped me design a cover and format the book so I could do a short run with Lulu to share with close family and friends. I spent the next year pouring through Jeff Herman’s “Book Publishers, Editors & Literary Agents” and diligently submitting my query letters. But after a while, that seemed like such a waste when this opportunity was out there to publish myself. I started doing some research (with Toni’s help) and eventually decided with my marketing and design background it just made sense to go the DIY route. So I self-published again in 2009 through Lightning Source and started finding fans and making sales. 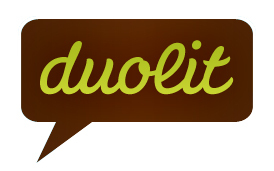 Duolit was born shortly thereafter so I’ve yet to finish a second complete novel (I have one novella under my belt and two participation awards for NaNoWriMo) but I’m working with a great editor now and hoping to release book two very soon! Laura: What questions do you get asked by authors the most? What advice do you give them? 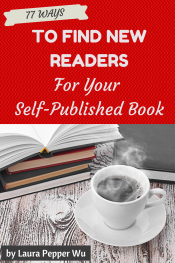 For the authors just looking for a place to start, we recommend focusing first on defining your one, ideal reader. Having a clear idea of who that person is will help you decide what blog topics to write about, what social media sites to use, what your website should look like and so much more. Just having that focus will make a huge difference for you and your fans. Of course, none of us have as much time as we’d like to do everything that needs to be accomplished in a day. 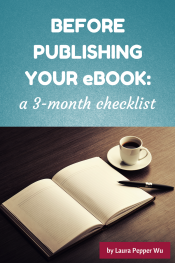 But it is possible to market your book without sacrificing huge chunks of time. We recommend creating overall objectives and then breaking them down into goals you can achieve with a couple 20 or 30 minute sessions each week (we call it the Boflex Method because it’s similar to how you would approach a gym routine). Having a concrete plan with specific goals and deadlines will help you become more efficient (We also recommend cutting your social media accounts down to two or three max!). 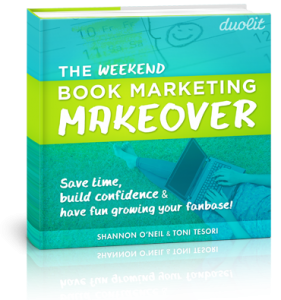 Laura: You just released a Weekend Book Marketing Makeover workbook which is free with a tweet or Facebook mention! Tell us all about it! We’re REALLY excited about the Weekend Book Marketing Makeover. 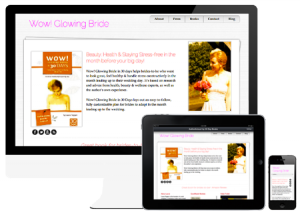 It’s a fun, quick read with clear steps for creating your own marketing plan from scratch. 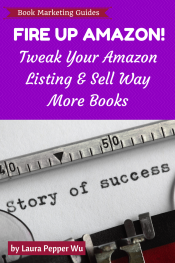 In just two days, you’ll have the knowledge and ability to promote your book without having to do any sleazy sales (that’s part of the five marketing myths we bust in the book!). Right now we’re offering the book on our website, all you have to do is “pay” with a tweet or a Facebook mention and it’s free. Laura: Where do you see the self-pubishing industry going in 2013/2014? Oh my gosh — the sky is the limit at this point, right? eBooks have really blown the doors off the whole industry. 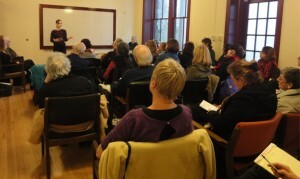 There are so many opportunities for authors right now it’s really an amazing time to be involved in publishing. I think eBooks are going to continue to grow rapidly in popularity, which means more competition in the market place. So more and more authors will really need to focus on their marketing efforts to get noticed — fortunately resources like KDP Select and our social media networks make that a relatively simple task to do. It can take a while to build up a following in this growing industry, but we’re so fortunate to have the opportunity to take control of our own careers — it’s all in our hands! Laura: Anything you wish I’d asked about but didn’t? Nope! I think we covered all the important stuff (unless you want us to talk about our favorite books and TV shows of the moment :-)).